In the developed world, it can be easy to forget that women in some other cultures can still be considered as secondary citizens in society. Indeed, with an election coming up this year, it’s sobering to remember that it is not yet 100 years since we women here in the UK were first entitled to vote. We have choices. And compared to many we have freedom, despite the fact that we might grumble about how much we hate our jobs/location/house/commitments/etc, etc, etc. I’m not going to issue platitudes about sparing a thought for women less well off (in every sense) than ourselves, but all you ladies, women and girls out there, I do urge you today to celebrate exactly who you are. 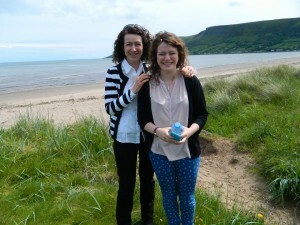 Jayne and Daughter – Celebrating Who We Are!